Ever popular, ever interesting: the Mantis style is a world wide phenomena. Its many branches include Seven Star, Six Harmony, Eight Step, Secret Door, Plum Blossom, Grand Ultimates and more. We have a number of good representatives here including a very detailed series by John Funk. This Seven Star progression is directly reflective of Wong Hon Fun's famous series so we linked to some of the hard-to-find Chinese texts related to the Northern Praying Mantis. Here are a lot of DVDs on this huge and healthy style. Enjoy. Visit our information section on the Praying Mantis. Click here for some of the hard-to-find original Chinese texts from Northern Praying Mantis and Master Wong Hon Fun. "As one of the major styles of Praying Mantis Boxing, Six Harmonies Praying Mantis has a mellow appearance but it also has a powerful hidden vigor. It focuses on cultivating the practitioner's ability for real fighting. Its movements, momentum and power are like tidal waves—overwhelming. This significant character made it one of the most sought after Kung Fu styles in Chinese martial history. This DVD is presented by Mr. Jian Gao who is an initiated disciple of grandmaster Ma Han Qing, and a gold medalist in the 5th International Wushu Invitational Tournament held in Beijing, China. Although the demonstrations themselves are not instructional, forthcoming DVDs in this series will break down the routines. *Note: For years, this DVD was ONLY available in PAL format and, although we sold quite a few of them, many customers have waited a long time for an NTSC version. Plum retained the rights to convert and publish this in NTSC (Region 0) format, and these new ones are now fully playable now on both computers and TV set boxes. IF YOU NEED A PAL VERSION, we still have a limited number of those. To order PAL copies, please select PAL VERSION below. 20% discount for PAL versions. LiuHe Tanglang is a fusion of two famous styles. Praying Mantis is, of course, world famous but during the 19th century Six Harmony Boxing was highly esteemed and well recognized among those boxers concerned with guarding China’s freedom and sovereignty. 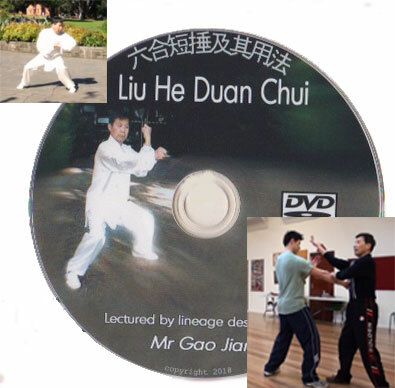 Among the major forms in this system there are two outstanding tao lu: Shuang Feng (Double Whips) and Duan Chui, the form on this DVD. Because LiuHe Tanglang is a style with some rare and distinctive fighting theory, some practitioners held back or could not transmit properly the key points of the art, leaving LHTL wel- known but little understood. It's advanced approach is a rare blend of body postures from Mantis and Monkey, combined with the whip-strikes of Tong Bei and Pi Gua, not to mention the “unified” strikes of Six Harmony Boxing. This DVD presents Short Strike, a form supposedly exhibiting the least amount of Praying Mantis influence and the greatest wealth of Liu He Quan. The DVD gives the form in demonstration mode with freezes and applications, utilizing a small group of students along with teacher Jian Gao, 8th generation follower of the style. $19.95 each or a 10% discount for ordering 3 or more ESPY DVDs. Jon Funk shows the fundamental set of the Seven Star system in the Qing Mo format. He also shows the Fifth Son Staff, a well known mantis form. Bung Bo is the foundation not only for Seven Star but many styles of the Mantis. The staff set is similar to the Lau Gar stick with a Double Yin hands Southern style flavor. Each of Jon Funk’s DVDs include the entire form at performance and teaching speed, clear explanations of the movements with attack and defense usage. Note: Advances but no menu. Here we have the Seven Star Mantis forms of White Ape Exits Cave and the Saber for Green Swallow with its fast combinations. Each of Jon Funk’s DVDs include the entire form at performance and teaching speed, clear explanations of the movements with attack and defense usage. Note: Advances but no menu. The Flying Goose Palm is considered an advanced set of the Seven Star Mantis. It’s movements are quick and somewhat soft mixing long and short actions with many willow leaf palms. The Second Route Plum Flower Spear is chock full of throws and changes with the spear reverses and body rolls with this very fancy and variable advanced spear. Each of Jon Funk’s DVDs include the entire form at performance and teaching speed, clear explanations of the movements with attack and defense usage. Note: Advances but no menu. 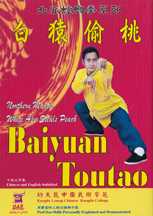 This DVD contains Buck Yuen Tow Toe (White Ape Steals the Peach) a basic and popular form. Steal Peach also helps to introduce many of the Seven Star Mantis basics: kicking, punching and positioning. 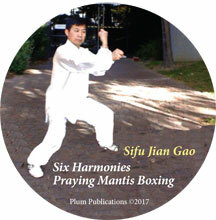 Valuable if you are looking for a progressive series of lessons to learn Seven Star Mantis. PM techniques like: tapping, reaction distance line system, effective pressure points, distractions joint locks and effortless pressure points. Many very clear demonstrations of Chin Na movements especially concentrating on the upper body and wrist, elbow and shoulder controls. Some nice, straight forward lectures on the principles and requirements of good control and proper execution. Everything with a mantis flavor but all the key principles quite universal. The Mantis Plum Flower Form, a more advanced set of the Mantis. Full breakdown of the moves. Definitely a more advanced form than previous. If Praying Mantis wants to move in a form it goes forward into a complete pose with all limbs used and balance very specific. This is a major Mantis form. Three Route Essence. An advanced level Mantis fist form with emphasis on throwing and other higher level techniques. This has a complete breakdown of the movements. Fast footwork, many jump back, quick hand moves, skipping kicks, linked hand sequences. Mantis Steals the Peach. This was Grandmaster Lo Guan Yu’s favorite hand set. Short but advanced, much trapping, with particular emphasis on “cheng” back hooking forearm smash and hand exchanging. As we said, an advanced but short for with a lot of emphasis on tactility. A lengthy set with a lot of movement. Throwing and evading tactics. Also quite a few height changes with special focus on the Kneeling Tiger stance. Multiple hand flurries mix with large throwing techniques. The Nei Gong of the Mantis system. Essential open Iron Palm techniques linked with Qigong breathing exercises. Said to be directly form the Shaolin Temple, these are called the Monk’s Martial Exercises. Iron Palm starts around 28 minutes in. All basic training slapping motions are covered and then there is a section on training in the air and against a telephone book for application of power. Targets are demonstrated on an opponent’s body. Sticky Hand drills, sparring drills, speed drills. This is a DVD of applied Mantis. Definitely Sticky Hands definitely not Wing Chun. Some patterned exercises that smoothly move into variations. For instance the first is a quick three-0attack and defend sequence. Teacher Funk first performs it with chops, then adds kick, then traps, then converts it all to elbow strikes, without loosing the flavor of the style. Then a section on sparring with particular goals in mind. Loose, comfortable and relatively light. This part of the series concentrates on street fighting and self defense skills. Many ideas here, from bag work with focus equipment to some leg sparring with a close approximation of Sticky Legs, to typical attacks such as chokes with the flavor of the Mantis in the counters. Much information not necessarily that advanced for some practitioners but education to see the Mantis answers to classic defense situations. This material comes from Yu Zhen Sheng of the Huang Pu Military Academy during the 1930's. At this time Huang Pu was the top military academy in China. Among others styles Yu taught Hong Quan, Pao Quan and Zha Quan not to mention this type of Mantis. From Yu it passed through Xu Gong Wei to this man, Fang Shan. This is said to be from a relatively secret style in Shandong and this form is the key set for understanding that system. It is not Bong Bu, but Chi Bu, Grasping Foot. The movements are long enough to resemble, at times, Contemporary Wushu. Spine stretches, actions are relatively soft with little emphasis on speed. Though there are no applications demonstrated the rather well done subtitles contain Fang's explanations of the use of the forms as he teaches the breakdowns. This DVD presents one of the favorite demonstration forms of well known teacher Law Kwong Yuk. Shifu Paul Eng is a lifetime practitioner of the art. His movements are soft, very refined and ever - dare we say it - joyous in execution. he never strains, he never grunts. The disk is well laid out with a history followed by basics in stances, punches and kicks. The form is cleverly shown in start-stop fashion with a complete description. Then the Four Sections are taught in a very clear presentation. Finally all four sections are shown with over 40 different applications. Shifu Eng's movements are so sophisticated that half the presentation lies in what is NOT discussed, simply shown. Here he leans a bit. Here he turns a tad. Watch and learn. See this instructor's numerous books on Mantis. The form that is often called the "first praying mantis set." Tak Wash Eng demonstrates his interpretation of this important and fundamental form. This DVD contains "archival" footage of Tak's own performance, multiple views of the form, animated history of the Praying Mantis and a foldout instruction booklet with demonstration by Paul Koh.